Ten years ago, my cousin made her wedding guests chuckle over her choice of favors: foam beer can holders that read “Jaime and Pat got married and all I got was this lousy beer koozie.” They were certainly much funnier than Jordan almonds would have been. And reusable, too, like the potted annual plants Jaime employed as beautifully understated table centerpieces. But being able to customize beer koozies – or chocolate bar wrappers, lip balm containers and wine bottle stoppers, to name only a few items sold on websites touting “cheap wedding favors” – demonstrates how deeply the wedding industry has dug to cash in on the age-old tradition of happy couples presenting guests with mementos of gratitude for sharing in their big day. Brides and grooms, it’s time to take back your day with favors that ring true to your local and sustainable vows while providing ample opportunity to show off your originality and style. I am no wedding planner, but I’ve borne witness to more than 40 couples tying the knot, and I certainly would have appreciated, for a number of reasons, a bottle of shrub. Shrubs are back in vogue – the most recent iterations are really just concentrated syrups made from fruit, vinegar and sugar – because they both quench thirst when mixed with a little soda water and balance out trendy cocktails when included in the shaker with a bit of booze. Tait Farms, based in Centre Hall, Pennsylvania, is the best-known of commercial shrub producers in the United States. You can buy their products at Vena’s Fizz House in Portland, and I can personally vouch for all the red ones – cherry, raspberry, rhubarb, strawberry and cranberry. And many local bartenders are showing house-made shrubs in signature drinks. Dietsch writes that making your own shrub is as easy as 2, 1, 1. That’s two parts fruit (fresh or frozen), one part sugar and one part vinegar. There are quicker methods that involve heating the vinegar to dissolve the sugar, but Dietsch prefers a cold-press method for making shrubs, because he thinks it pulls more flavor from the fruit. He macerates fruit and sugar for a few days, drains the juices through a fine-grained sieve, pours vinegar over the fruit solids, and bottles up the vibrantly colored and brightly flavored syrup. The shrub should sit in the refrigerator for about a week before you use it, to give the natural yeasts time to soften the sharp vinegar, but can keep for weeks, even months, thereafter. The fruit solids can be repurposed as a yogurt topping, smoothie ingredient or condiment for cheese. While the recipe is simple, the potential flavors are limitless. 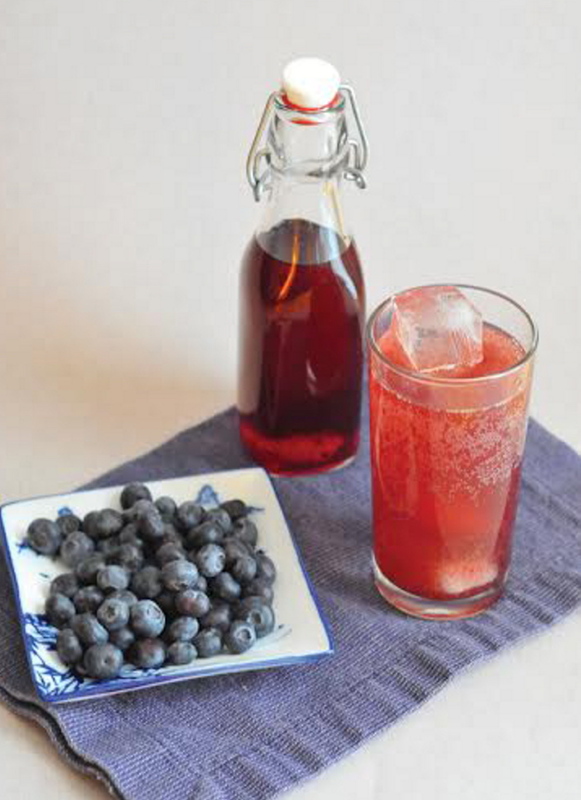 In his book, Dietsch suggests shrubs made of peach, ginger and cinnamon; blueberry-lavender, a natural combination for Maine weddings (recipe below); and watermelon and basil. He also suggests savory and sour combinations like Sun Gold tomato and celery, or plum, peppercorn and bay leaf. In terms of both time and resources, the bar to entry is low for experimenting with shrubs to find one you truly love, Dietsch says. If I were a bride in search of a favor that could be customized to my tastes; matched to the colors my bridesmaids were wearing; made in advance from ingredients local to my venue; and featured in cocktails and mocktails served at my wedding, I’d look no further than shrub. Adapted from a recipe in Michael Dietsch’s “Shrubs: An Old-Fashioned Drink for Modern Times.” Dietsch writes his recipes for small batches. But you can scale up the recipe to use it for wedding favors – the limit is available refrigerator space, not chemistry. Be sure to keep the same fruit-to-sugar-to-vinegar ratio. For uniform results, store multiple batches in large containers before you pour them into smaller containers; 4-ounce mason jars or similarly sized decorative bottles will provide enough shrub for 4 spritzers or 6 to 8 cocktails. Place blueberries and sugar in a medium bowl. Crush the berries a bit with the back of a spoon and stir to combine. Cover the bowl and refrigerate for 2 days. Place lavender in a nonreactive container, cover with cider vinegar and store in a cool, dark place for up to 2 days. Position a fine-mesh strainer over a small bowl and pour blueberry and sugar mixture through to remove solids. Pour vinegar mixture into the strainer over the fruit solids. You may have some sugar clinging to the berry solids in the strainer. If so, set the strainer with the solids over another small bowl. Pour the syrup-and-vinegar mixture over the solids to wash the sugar into the bowl. Repeat as needed. Pour the shrub into a clean, non-reactive containers like mason jars. Cap them and shake well to incorporate any undissolved sugar. Place jars in the refrigerator for a week before using.